Two women inform, inspire and motivate moms to embrace the posh life. “Posh,” adj: smart, fashionable, elegant, luxurious. Images of fancy cars, designer duds and lavish parties typically come to mind, not dirty diapers, wailing children and minivan-driving moms. But according to Amy Nebens and Jara Negrin, co-creators of the soon-to-be-published book, Living The Posh Mom Life, and the trendy Web site www.poshmom.com, any Mom can be a posh Mom! In their minds, being posh is not a reflection of prosperity. It’s all about devoting yourself to your children, husband and yourself. Their creation of the Posh Mom brand is a paradigm of this principle that they are sharing with a “new generation of mothers” who strive to be marvelous mothers and women at the same time. Nebens, a former magazine editor, and Negrin, a former child actress and savvy businesswoman, are busy moms and devoted wives who have dedicated the past two years toward the inception of the Posh Mom brand. 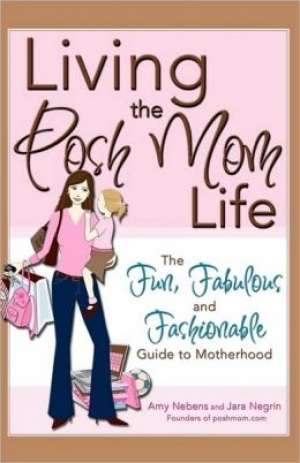 Living The Posh Mom Life hits bookstores this spring just in time for Mother’s Day, and the Web site is expanding its offerings on a daily basis. How did the posh partnership begin? The two talented women first met at their children’s preschool in Westport, CT, and their clever brand developed over conversations about the struggle among moms who crave to keep up with current trends but just simply don’t have the time. Now, all such moms have to do is to visit the attractive, efficient Web site and sign up to receive the daily Posh Mom Pick e-mails that feature products, presents and pertinent tidbits of information. Each daily pick is then archived into one of five categories that affect every posh Mom’s life: fashion, beauty, home/entertaining, travel/culture and body/soul. When they first launched the site, the duo featured items that they personally adored, as well as products suggested to them by friends. But as word spread of their quick and clever product reviews, PR companies started to send them the latest and greatest out there for moms. What’s particularly unique about their picks is that any Mom in any part of the country can access them. Unlike sites that feature products found in a particular region, such as the ever-expanding Daily Candy, the poshmom.com site promotes products sold over the Web or by phone. According to the duo, every woman can infuse a little bit of posh into everything that she does. First, you must develop the mindset, and then you put it together on the outside— with the help of their site, of course. Purchase fashionable lafolie knitwear to keep your little ones warm all winter, personalize your family’s Ralph Lauren duds, learn about which airports have mini-spas for long layovers or order travel packs of nail polish remover pads with the click of the mouse. Proud to be the first to know about many of the products that they feature, the Posh Mom creators stay ahead of the trends and can identify with the desires of their target audience. Interested in bonding with other Posh Moms? Visitors of the Web site can also sign up for Posh Mom parties that are girls-only events designed just for them. Although Negrin and Nebens are still analyzing and finalizing party plans and locations, they have received a huge response among moms who are eager to bond with their gal pals. Everything posh is discussed and purchased at these afternoon affairs, from nutritional information to beauty advice, bottle holders and baby clothes. And not only can moms fill up on their favorite products, but they can also give back to less fortunate families by bringing in slightly used baby goods from home. A portion of the proceeds from every Posh Mom party, in addition to the donated goods, is then given to Room to Grow, a non-profit organization dedicated to babies born into poverty. Planning posh parties, writing product reviews, updating the Web site— it’s all in a day’s work for the founders. Working from a home office, they have learned to juggle familial responsibilities with work duties, which they say would be impossible without the support of their husbands. “We love that we can do this and still dedicate ourselves to our families,” Negrin says. Both women also admit that once they left the working world to settle down with their families, they yearned for a creative outlet. Posh Mom developed into a project in which they could channel their passions and exercise their individual talents. In the past, Nebens launched a successful manufacturing and exporting business of children’s hair accessories and jewelry while she lived in Mexico, as well as authored six books, and Negrin’s background at Martha Stewart magazine influenced the content and appearance of the Web site. Still doubting your “poshness”? Try taking their advice— put yourself on your own to-do list and see if it makes you a happier, more hip woman and Mom. You deserve it! …and yourself on your to-do list. Be hip, savvy and sensational. Treat yourself to the fine things in life (even if it’s just one or two). Aspire to be stylish. Show concern for others—adopt a worthy cause and teach your kids to do the same. Aim to be a role model— for family and friends. Don’t waste time on gossip (at least not too much time!). Be grace under pressure, even at your most frazzled moments.